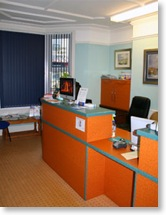 The Channings is a family dental practice based in Porthcawl, South Wales and is the longest established dental practice in the town having opened in 1939. A practice with an emphasis on caring, preventative dentistry (particularly with children) and a policy of continual improvement offering up to date treatments and technologies within a friendly environment. The practice was fully computerized in 2008 and is moving towards having no paper notes, records or conventional x-rays. As is now recommended we use a digital x-ray system that reduces patient exposure by up to 80% compared with conventional x-rays and enables immediate viewing of your images. In addition to our General Dental Council registration and registration with the Local Health Board, the practice is also registered with Health Inspectorate Wales and are able to provide private dental treatment. Our Surgery, sterilization and administration equipment is all of a high standard and the practice was highly commended on our last inspection. We also offer automatic SMS text message and e-mail reminders to your mobile phone of your next appointments. A great smile can make a huge difference to the way we look and feel about ourselves and to the way in which other people react to us. Like us on Facebook for the latest news on the practice.